Mama is up to her eyebrows writing and web designing, so I volunteered to provide today’s post. I didn’t tell her, but I know you’d rather hear about me anyway because it’s been a while. Here’s what’s on my mind — donuts. I think my house needs a steady supply of donuts. The glazed kind is my favorite, and I prefer them slightly chilled. None of that gooey melting stuff. I like to see my glazing. Donuts are my very favorite people food though I must say you people eat way better than your pets. Oh, I know what Rachel Ray and the others say. Their pet food is chock-full of real veggies and fruits, so it’s not only good for us, it tastes delish too. Have you ever tried kibble? I didn’t think so. Try it some time. Like eating a cardboard box. Anyway, I’ve got Mama trained to put fresh stuff in my food at every meal. Peas, carrots, green beans, yogurt, bits of chicken or beef. But I don’t get enough donuts. And I do love sweet things. I love them almost as much as I love the moose Mama got me for my last birthday. Mama says fat dogs shouldn’t eat donuts. Who’s she calling fat?? 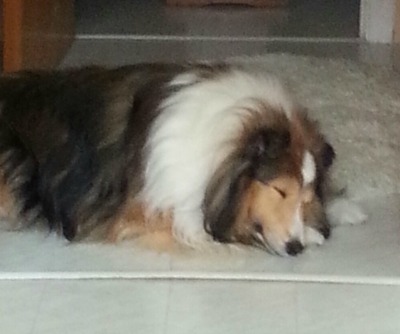 I’m just big-boned for a Sheltie. And if I didn’t help her eat the donuts, why, she’d be fat, heehee! I hear her stirring around now — probably wondering what I’m doing to her precious blog. You folks have a good week. Me? I’m ready for my nap. 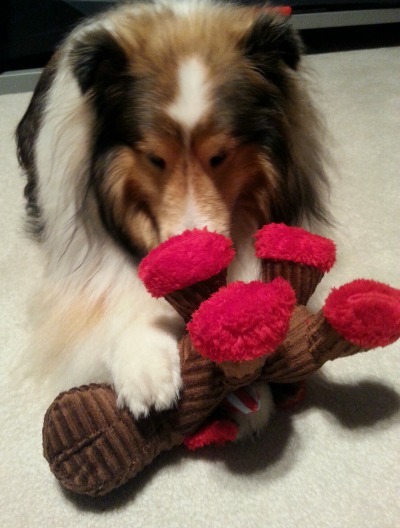 This entry was posted in Dogs and tagged donuts, feeding pets, Sheltie. Bookmark the permalink. Gee, Miss Lucy, did Mama tell you to confirm that too many donuts can make one fat?? Sounds just like something she’d do, sneak behind my back and dis my favorite food. Humph! Well, yes, Moose is fun, and I do suppose it wouldn’t hurt for me to give Mama a hug for you. Licks for Mr. Terry, okay?? I have to say she didn’t tell me that – but I know from my own experience! But make sure you still sneak one or two donuts, my nan always says that a little bit of what you fancy does you good! Terry sends purrs back to you and mama and is very jealous as he isn’t allowed donuts at all! I love your nan! Bet she’d feed me a spot of donut now and then! Poor Terry. Never getting donuts? How does he stand it?? What lovely words, ma’am — thank you! And you’re welcome to stop by any time! Hey, Dallas. You got it good. My mom makes me eat grain free food and I’m on strict rations. I’ve never even seen a donut let alone taste one. Oh, wait! When I was on the streets of San Antonio some guy gave me a taco. I guess that is like a crunchy donut. Anyway, I know a good lawyer if you need one. Your friend, Lucy the Boxer. BTW love your hair. Poor Lucy. Mama feeds me grain-free, too (the Weight Watchers kind, no less! ), so I know what you mean. No roaming the streets for me. And I’ve never had a taco. The Kid (Domer) seems to like them, though I can’t believe they can be as good as a donut. Shoot, I’m blushing — you don’t think I have too many furs?? Naw. looks good on ya. I wish I had enough to hide my hips then mama wouldn’t notice and maybe I’d get a table scrap or two. You should have your mom bake you a pie — those things are GOOD!! And say, if you need some furs, I can send you my extras. My grooming lady usually says she could make a small dog out of my scraps, heehee! I love steak, Miss Audrey! But every good meal deserves dessert, don’t you agree? And what could be more perfect than lots of donuts as a bedtime snack?!! Dallas, this was probable my VERY FAVORITE post you’ve ever written, although I’ve loved them ALL! OMG…you are the cutest, cutest, cutest, cutest dog EVER in the whole wide world! And I must say, a witty, clever and very excellent writer too! Like you, whenever I eat a donut, I much prefer it chilled rather than warm and gooey. Oh, and another thing, pizza is a favorite of mine as well. I could actually eat pizza once or twice a week and never tire of it. Thanks of the great post, my canine friend. You’re a delight! You definitely have a future in blogging! Have a super-duper rest of your week! WOOF…WOOF! P.S. And please tell Mama I said hello, okay? Aw, thanks, Mr. Ron! Aren’t pizza and donuts the BEST?? I never get them at the same time, but I’ll bet doing so would be like Doggie Heaven! Mama’s doing something called editing today, so I have free rein over her post. Perhaps I should say ‘reign’?!! It’s definitely not ‘rain.’ Sigh, if I had thumbs I could open a dictionary and look it up myself. I think maybe I have the beginnings of a new project for you, my dear, sweet-loving doggie. How about a film titled “Dallas Does Doughnuts”? Your mama may have to explain to you why I find that title so hilarious, but you’d clearly make a fine leading character! Miss Linda, I’ll bet my mama would get a kick out of the new project you see in my future! Then I’d have something to do besides sleep and dream of donuts. I know I’m a lucky dog to get donuts at all, especially with all my furs that make me look … ahem, BIG, but there you have it. And isn’t it normal to prefer a bit of sweet after a meal?! Dallas, you will have to come visit me some time. A new, gourmet donut shop just opened up a few blocks from me. Imagine the donut version of those gigantic cupcakes. Are you in? Gee, thanks, Miss Lana! I’ve never had chocolate — Mama says it’s not good for me. Donuts probably aren’t either, but at least they’re not poisonous to us doggins. Oh Dallas – so nice to hear from you! Big boned and beautiful! Thank you, Miss Barbara! Mama doesn’t pick me up as much as she used to, but I don’t blame that on ME — she’s getting older, you know, heehee!! Dallas you sure do lead a good life. Fresh veggies topped off with a donut. You are lucky to have such a loving Mama. Indeed I am, Miss Pat! The only thing that would make life more grand would be MORE donuts, ha! Dallas Dallas Dallas! So good to hear from you! First off you are not fat! So yes you should have another donut. Second, pizza is always good, see if you can get some of that too. Just be careful, no onions. Katie agrees kibble is for someone else. Since we’ve been in Florida her boyfriend Riley’s mom has been feeding her refrigerated food. She says she’s never going back to kibble. We’ll see. Refrigerated food?? Miss Dawn, my mama has never tried me on that, but it sounds delish (especially if it comes in a container that rattles!) Enjoy your trip and give Katie a hug!